Comfort Me Oh Mac and Cheese! Lidia Bastianich made this recipe recently on Lidia's Italy. It looked amazing and pretty easy, so I looked it up on her website and unfortunately it wasn't posted. This always seems to happen whenever I really want one of her recipes. Luckily, I had it on my DVR and was able to replay it about 300 times in order to get all the details right. I changed it just a bit and some of the amounts may be off by a little, but it turned out great just the same! I highly recommend making this version of mac 'n cheese. It certainly is not the traditional American style we are all used to, but I think you will be blown away by the flavor! Bring a large pot of water to a boil and add a handful of kosher salt. Reduce heat and keep on water simmering. Add 2-3 tablespoons olive oil to a large saute pan over medium heat. Add in shallot and sea salt; cook for about 1-2 minutes. Move shallot over to the side of the pan and add bacon to the open "hot spot"(as Lidia calls it), in the pan. Cook for about 3 minutes and then mix the shallot and bacon together. Add diced potato and cook for about 3-4 minutes. Add about 4-5 ladles of boiling water to the potato bacon mixture and stir. Add additional salt at this time. As the mixture simmers, add the pasta to the boiling water and cook until al dente. Add the pasta to the potato mixture and stir to combine. Turn off the heat and add about 2 tablespoons of olive oil, grated cheese, tomatoes, and diced provolone. Stir to combine. Serve immediately. Note: Lidia suggests the dish to be served immediately, but I found a way around this. If you want to prepare this dish ahead of time, follow the recipe up to the point of adding the pasta to the potato mixture. Let it cool and refrigerate. When ready to serve, re-heat over low/medium heat and add in additional water if dry. Once heated through, add in the remaining ingredients. If there's any comfort food better than mac and cheese, I don't know what it is! The new version of Mac and cheese is different but tasty .Great job Annie,bambola. I just saw Lidia cook this on PBS this morning. It looks so wonderful! I have been looking for her recipe online to no avail. Of course she wouldn't post it because she's trying to sell her book. I can't blame her! Thank you Annie for writing it down for us!! Laura, Your welcome. I had to guesstimate on the amounts but it turned out great. You should try it for sure. I know you'll love it! I really appreciate you finding and posting this recipe. I have all three of Lidia's books and couldn't find it. 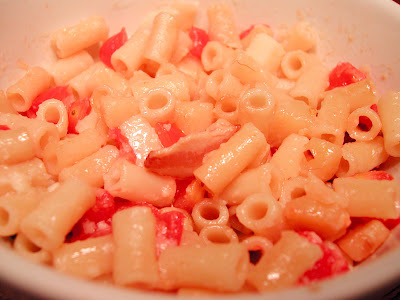 Like you I went online and found a lot of Neapolitan Macaroni and Cheese recipes but they were way too long and detailed. I am definately going to try your version. It's just my boyfriend and myself and when we make Lidia's recipes there is always way too much. Thank you for taking the time to spread the love. Wow, thank you for posting this recipe. I just watched this on PBS and could not find the recipe either despite a note on the bottom of the screen said to visit her website for the recipes. I think she also used smoked provolone cheese, which would make a big difference in taste. We love smoked cheese. Thanks for doing this! I had practically every one of her episodes recorded on my DVR, then its entire memory got deleted. Happy to see the recipe here. Can't wait to try it. Thank you for writing this down for us! I saw it this AM on her show, and have been looking all over the web for the recipe. Can't wait to try it tonight! Thanks! Thank you so much for providing the recipe. I just watched the show and immediately went to find the recipe, just like I would when I watch any Food Network show. Unfortunately, PBS did not provide it. I can't wait to try the recipe. I too saw this recipe and looked it up and couldn't find it. Could you please tell us the exact amout of the smoked provolone she used? Thanks for the effort!! T, I would be guessing since she didn't say. But I would say it was probably 2 cups. Hope that helps! I was looking for this recipe high and low, thanks so much for your hard work! I too have been slightly obsessed over finding this recipe. Thank you. Can't wait to make it tonight! Thank you! Searched and searched for this, guess you have to buy her book to get it. I'm trying a veggie version, we'll see how it turns out!